Karaburun is a small town with 2000 inhabitants on the aegean coast. It is 100 km northwest of Izmir, situated on the utmost top of a peninsula in the aegean sea. The region fortunately was not an aim for mass tourism. The peninsula is mountainous ( up to 1218 m) , the vegetation is typically mediteranean, the see is turquoise and clear, the climate pleasant; also in summer often there is a pleasant wind. 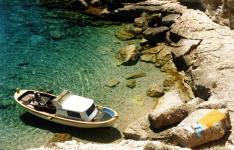 The people in Karaburun are living on fishery and agiculture (olives und narcissuss) and on few mainly turkish tourism. Karaburun invites you to hiking tours, swimming, relaxing, dreaming. It is a very nice place for holidays!! Excursions to the close villages, motorboat tours to lonely bays or to the close islands can be easily organized. Also sightseeing or shopping tours to Izmir, Ephesos and Pergamon are possible. Seza Bedsi Füchsle will help you always to organize such tours. See more pictures of Karaburun!